Large predator fish contain significant amounts of mercury, a neurotoxin which can affect fetal development, memory, mental focus, and produce tremors. Shifting baselines is a term which describes the way significant changes to a system are measured against previous baselines, which themselves may represent significant changes from the original state of the system. The term was first used by the fisheries scientist Daniel Pauly in his paper "Anecdotes and the shifting baseline syndrome of fisheries". 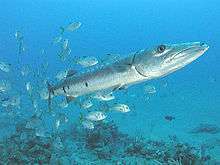 Pauly developed the term in reference to fisheries management where fisheries scientists sometimes fail to identify the correct "baseline" population size (e.g. how abundant a fish species population was before human exploitation) and thus work with a shifted baseline. He describes the way that radically depleted fisheries were evaluated by experts who used the state of the fishery at the start of their careers as the baseline, rather than the fishery in its untouched state. Areas that swarmed with a particular species hundreds of years ago, may have experienced long term decline, but it is the level of decades previously that is considered the appropriate reference point for current populations. In this way large declines in ecosystems or species over long periods of time were, and are, masked. There is a loss of perception of change that occurs when each generation redefines what is "natural". ↑ Swartz, W., Sala, E., Tracey, S., Watson, R. and Pauly, D., 2010. "The spatial expansion and ecological footprint of fisheries (1950 to present)". PloS one, 5 (12): e15143. 1 2 3 4 5 6 7 8 9 10 11 12 Hilborn, Ray (2005) "Are Sustainable Fisheries Achievable?" Chapter 15, pp. 247–259, in Norse and Crowder (2005). 1 2 3 4 Preikshot, Dave and Pauly, Daniel (2005) "Global Fisheries and Marine Conservation: Is Coexistence Possible?" Chapter 11, pp. 185–197, in Norse and Crowder (2005). ↑ Huxley, Thomas (1883)Inaugural Address Fisheries Exhibition, London. ↑ Goode GB and Collins JW (1887) "The fresh-halibut fishery". In: The fisheries and fishery industry of the United States. Section V. History and methods of the fisheries, Vol. I, Part I. Government Printing Office, Washington, DC. p. 3–89. ↑ Casey JM and Myers RA (1998) "Near extinction of a large, widely distributed fish" Science, 280:690–692. ↑ Pauly, Daniel (2004) Reconciling Fisheries with Conservation: the Challenge of Managing Aquatic Ecosystems Fourth World Fisheries Congress, Vancouver, 2004. ↑ Ludwig D, Hilborn R and Walter C (1993) "Uncertainty, resource exploitation and conservation: Lessons from history", Science, '230:17–26. ↑ Jacquet J (2009) "Silent water: a brief examination of the marine fisheries crisis" Journal Environment, Development and Sustainability, 11(2):255-263. ↑ Sarwar G.M. 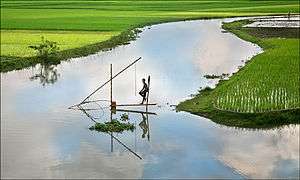 (2005) "Impacts of Sea Level Rise on the Coastal Zone of Bangladesh" Masters thesis. Lund University. ↑ Watling, Les (2005) "The global destruction of bottom habitats by mobile fishing gear" Chapter 12, pp. 198–210, in Norse and Crowder (2005). 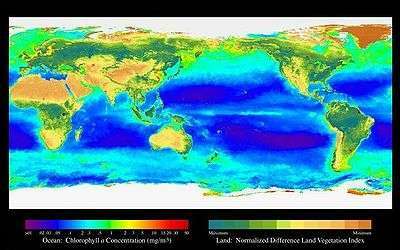 ↑ Observations: Oceanic Climate Change and Sea Level In: Climate Change 2007: The Physical Science Basis. Contribution of Working Group I to the Fourth Assessment Report of the Intergovernmental Panel on Climate Change. (15MB). ↑ Doney, S. C. (2006) "The Dangers of Ocean Acidification" Scientific American, March 2006. ↑ Cheung, W.W.L., et al. 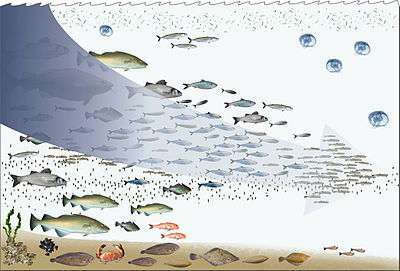 (2009) "Redistribution of Fish Catch by Climate Change. A Summary of a New Scientific Analysis" Pew Ocean Science Series. Oct 2009. ↑ Benjamin S. Halpern, Shaun Walbridge, Kimberly A. Selkoe, Carrie V. Kappel, Fiorenza Micheli, Caterina D'Agrosa et al. 15 February 2008. 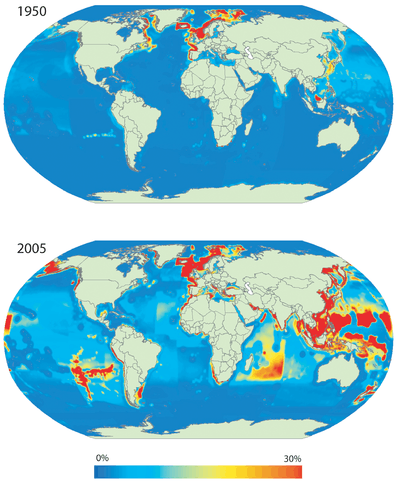 "A Global Map of Human Impact on Marine Ecosystems." Science, 319(5865):948–952. ↑ Census of Marine Life — the largest oceanographic project in history. ↑ Hilborn, R (2007) "Managing fisheries is managing people: what has been learned?" Fish and Fisheries, 8:285–296. ↑ Pauly, D. (2007). Off-site Link "The Sea Around Us Project: Documenting and Communicating Global Fisheries Impacts on Marine Ecosystems." Ambio, 36(4): 290-295. ↑ Sumaila, U.R., Khan, A., Watson, R., Munro, G., Zeller, D., Baron, N. and Pauly, D. (2007). "The World Trade Organization and global fisheries sustainability." Fisheries Research, 88: 1—4. ↑ Fish Proverb v2.0 (Bringing in Rules) Paul Romer, 29 July 2009. ↑ Running notes from session 7 Paul Romer at TEDGlobal 2009. ↑ Sumaila, U.R. and Pauly, D. (2007). "All fishing nations must unite to end subsidies." Nature, 450: 945. ↑ Clark C, Munro G and Sumaila UR (2004) Subsidies, Decommissioning Schemes and Effective Fisheries Management Fourth World Fisheries Congress, Vancouver, 2004. ↑ Sumaila UR (2004) Valuation and the reconciliation of fisheries with conservation Fourth World Fisheries Congress, Vancouver, 2004. ↑ Pitcher TJ and Pauly D (1998) "Rebuilding ecosystems, not sustainability, as the proper goal of fishery management" Pages 311-325 in T Pitcher, D Pauly and P Hart, Reinventing Fisheries Management, Chapman & Hall. ↑ Christensen, Villy (2004) Using ecosystem modeling for fisheries management and marine ecosystem conservation: Where are we? Fourth World Fisheries Congress, Vancouver, 2004. 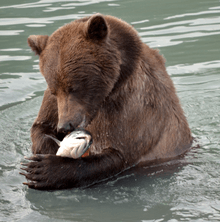 ↑ Pew, SeaWeb shrug off oil to target fishing. Retrieved 11 October 2009. 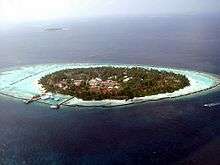 ↑ Protecting Sea Life: Marine Reserves Callum Roberts. Retrieved 20 September 2009. ↑ Seas of Plenty The Wildlife Trusts. ↑ Fish Info Network from Globefish Globefish is the unit in the Fisheries Department of the FAO responsible for information on international fish trade. ↑ Naylor, R. L., Goldburg, R. J., Primavera, J., Kautsky, N., Beveridge, M. C. M., Clay, J., Folke, C., Lubchenco, J., Mooney, H. and Troel, M. (2001). [www.esa.org/science_resources/issues/FileEnglish/issue8.pdf "Effects of Aquaculture on World Fish Supplies."] Issues in Ecology, 8: 1—14. ↑ The Greening of the Blue National Geographic Magazine, April 2007. ↑ Pauly, D. "Aquacalypse Now" The New Republic, September 28, 2009. ↑ Sustainable Fisheries Partnership Home page. ↑ Sustainable Fisheries Partnership: SFP Briefing: Sustainable Aquaculture Feeds and Wild Fisheries , 2009. 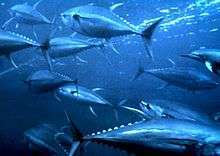 ↑ Sustainable Fisheries Partnership: Press Release: Growing issue of sustainable aquaculture feeds present threats and opportunities – seafood retailers risk charge of ‘blue-washing’ September 28, 2009. ↑ Millennium Development Report 2008: Goal 7: Ensure environmental sustainability United Nations. ↑ Millennium Development Report 2008 United Nations. ↑ Advice for Seafood Lovers Callum Roberts. Retrieved 20 September 2009. ↑ J. L. and D. Pauly. (2007) "The rise of consumer awareness campaigns in an era of collapsing fisheries" Marine Policy, 31: 308-313. ↑ UBC Fisheries Centre (2008) The Global Extent of Illegal Fishing University of British Columbia. 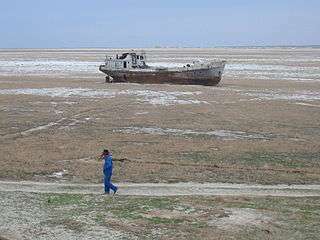 ↑ Looting the Seas iWatch News, 17 March 2012. Worm B, Hilborn R, Baum JK, Branch TA, Collie JS, Costello C, Fogarty MJ, Fulton EA, Hutchings JA, Jennings S, Jensen OP, Lotze HK, Mace PM, McClanahan TR, Minto C, Palumbi SR, Parma AM, Ricard D, Rosenberg AA, Watson R and Zeller D (2009) "Rebuilding global fisheries" Science,325:578-585. Grafton RQ, Hilborn R, Ridgeway L, Squires D, Williams M, Garcia S, Groves T, Joseph J, Kelleher K, Kompas T, Libecap G, Lundin CG, Makino M, Matthiasson T, McLoughlin R, Parma A, San Martin G, Satia B, Schmidt C-C, Tait M and Zhang LX (2008) "Positioning fisheries in a changing world" Marine Policy (United Kingdom), 32:630-634. Hughes TP, Bellwooda DR, Folkeb C, Steneck RS and Wilson J (2005) "New paradigms for supporting the resilience of marine ecosystems" Trends in Ecology & Evolution, 20(7):380-386 . Gell FR and Roberts CM (2003) "Benefits beyond boundaries: the fishery effects of marine reserves" Trends in Ecology & Evolution, 18(9):448-455 . Pauly D, Christensen V, Guénette S, Pitcher TJ, Sumaila UR, Walters CJ, Watson R and Zeller D (2002) "Towards sustainability in world fisheries" Review article. Nature, 418: 689-695. 824 citations. Devine1 JA, Baker1 KD and Haedrich RL (2006) "Fisheries: Deep-sea fishes qualify as endangered" Nature, 439: 29. Banobi JA, Branch TA and Hilbourn R (2011) "Do rebuttals affect future science?" Ecosphere, 2 (3): article 37. Branch, TA; Watson, Reg; Fulton, Elizabeth A.; Jennings, Simon; McGilliard, Carey R.; Pablico, Grace T.; Ricard, Daniel; Tracey, Sean R. (2010). "Trophic fingerprint of marine fisheries" (PDF). Nature. 468 (7322): 431–435. doi:10.1038/nature09528. PMID 21085178. Pauly D and Froese R (2012) "Comments on FAO’s State of Fisheries and Aquaculture, or ‘SOFIA 2010’ Marine Policy, 6: 746–752. Sethi, SA; Branch, TA; Watson, R (2010). "Global fishery development patterns are driven by profit but not trophic level". Proceedings of the National Academy of Sciences. 107 (27): 12163–12167. doi:10.1073/pnas.1003236107. Worm, Boris; Hilbourbe, Ray; and 19 others (2009) "Rebuilding global fisheries" Science, 325:578–585.